2 Pack 10 in. Sample(1 black, 1 beige) - SHIPS FREE! PRO, 125 ft Jumbo Uncut Beige - SHIPS FREE! PRO, 125 ft Jumbo Uncut Black - SHIPS FREE! PRO, 125 ft Jumbo 10" Pre-cut Black - SHIPS FREE! PRO, 125 ft Jumbo 10" Pre-cut Beige - SHIPS FREE! PRO, 10" Pre-cut, 20 Strips Rage Red - SHIPS FREE! PRO, 10" Pre-cut, 20 Strips Sonic Blue - SHIPS FREE! PRO, 10" Pre-cut, 20 Strips Jet Black - SHIPS FREE! PRO, 10" Pre-cut, 20 Strips Stealth Beige - SHIPS FREE! PRO, 10" Pre-cut, 20 Strips Laser Blue - SHIPS FREE! 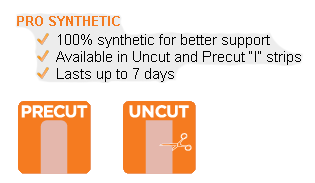 PRO, 10" Pre-cut, 20 Strips Hero Pink - SHIPS FREE! PRO, 10" Pre-cut, 20 Strips Winner Green - SHIPS FREE! PRO, 10" Pre-cut, 20 Strips Epic Purple - SHIPS FREE! PRO, 16 ft Uncut Beige - SHIPS FREE! PRO, 16 ft Uncut Black - SHIPS FREE! 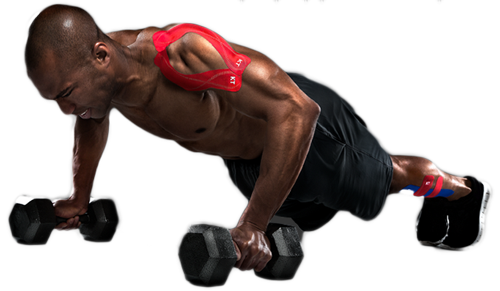 KT TAPE PRO Kinesiology Tape is a specialized tape that will give you support through even the toughest regimens. 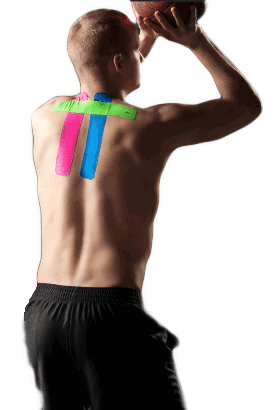 Kinesiology tape is strategically placed to reduce pain and provide structural or muscular support. In addition, KT TAPE PRO decreases swelling, increases blood circulation, and assists with lymphatic drainage. It's similar to the original KT TAPE, made from cotton, however it's made from 100% synthetic fibers for additional durability while being breathable. This allows it to serve a variety of functions with longevity that's unsurpassed. In fact, KT TAPE PRO synthetic will stay in place up to seven days, which is double the wearing time over its cotton counterpart. Its unique adhering properties will endure grueling workouts, daily showers, humidity, dryness, variable temperatures, even being submersed in a pool. KT PRO was re-engineered to withstand various and harsh environments and still hold on strong. The synthetic microfibers are latex-free and have antimicrobial properties to prevent the growth of microorganisms when sweating or in contact with water. To ensure the longest wearing, make sure to prep the skin with an alcohol prep pad or similar solution. 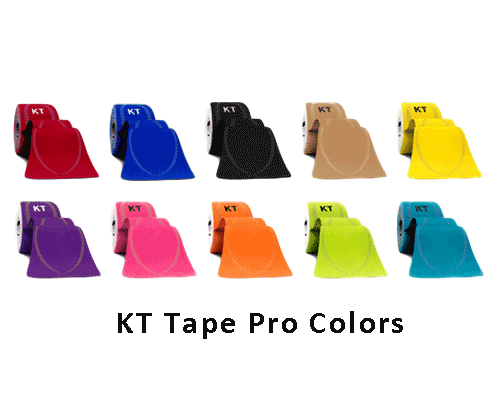 KT PRO Kinesiology Tape comes in a variety of packaging for individual-use or jumbo rolls for bulk savings to tape athletes in sports programs or gymnasiums. The jumbo uncut rolls are available in 125 feet and 16 feet lengths and come in a protective case. 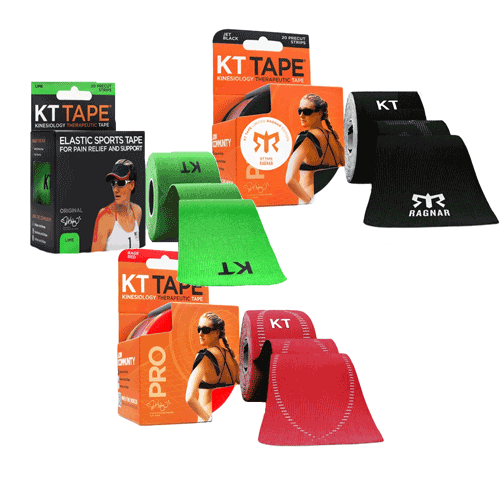 There is also the KT TAPE PRO precut variety that's makes it easy-to-apply with 20 precut "I" strips that are 10 inches. This makes for hassle-free application. The "I" strips also feature rounded corners which aid in preventing snagging or fraying. Choose from a variety of bright and popular colors. For added safety when running outside in the dark, reflective properties for safety when working out in dark outdoor environments. After a tough practice or workout, you may want to sooth tired and achy muscles by applying Biofreeze pain relieving gel. I've used both KT Tape and Kinesio. KT tape works better and stays in place better. I will purchase again. I run at night when it is significantly cooler. KT Tape not only supports your muscles where it is applied, but has reflective properties that add a safety feature when running in the dark. I have also found that the tape maintains its elasticity for longer periods of time than other brands, allowing me to apply on Friday evening for use all weekend long. I remove it for work on Monday and its adhesive properties and elasticity are still performing strong. It continues to stick through sweat and showers. The pre-cut nature of the tape make it easy to apply. I also found the training videos very helpful to get the application process completed correctly to provide the best support. I love KT Tape! It’s the design of this tape that sets it apart from other brands. KT Tape is constructed of multiple 10-inch strips formed into a roll that have a perforation between each strip for easy pulling apart. Rounded corners keep the tape from snagging on clothing or pulling up at the corners. A perforated center allows you to split the tape for numerous applications. 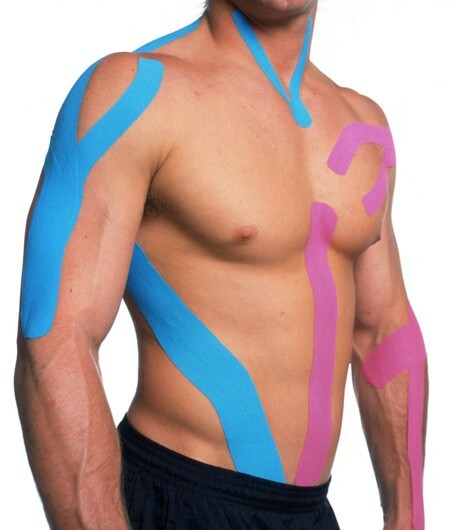 Once applied, I found that the tape stays in place well to support various muscle groups. Some of my friends get into the different colors and it seems to become somewhat of a fashion show, but I am OK with just black tape and the support it provides for the sporting events I participate in.